Lyon is the second biggest city in France and has been a major center since the Romans settled here. Where the mighty Rhône and Saône rivers meet, it’s a crossroads for France and Europe. Prosperity followed in the 16th century when Lyon became the most important silk-manufacturing city in France. Today Lyon is one of France’s most exciting cities, helped by the recent renovation of whole formerly industrial quartiers. Add the reputation of France’s gastronomic heart and you have a winning city to visit. If you drive to Lyon, don’t be put off by the industrial sprawl that surrounds the city. Once you are in the center, it all changes. If you come by car, park in one of the many car parks and use the eco-friendly tram system and frequent buses to get around. Lyon is divided into different districts, each with its own character. The city is compact with a good transportation system, so it’s easy to move around. Old Lyon (Vieux Lyon) is part of the medieval city with the Cathédrale St-Jean and the Musée Gadagne. Runningup the hill behind is the Fourvière hill, topped off by the strange Basilique Notre-Dame which you get to on the funicular railway. Climbing up the hill are the Roman remains of Lyon and the Gallo-Roman Museum. 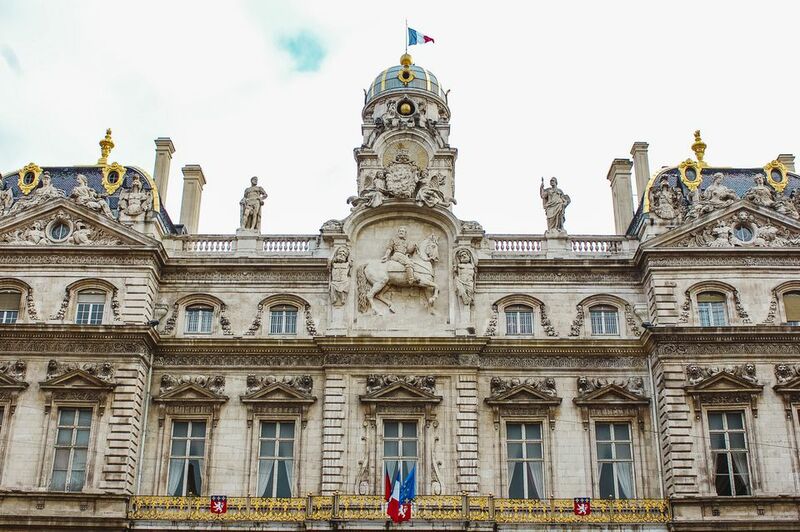 The Presqu’île or peninsula is the most visited part of Lyon with old streets full of restaurants and shops and two major squares: the spacious Place Bellecour with the Tourist Office and the Place des Terraux surrounded by cafes which spill out onto the pavements. La Croix-Rousse was the area where the silk workers lived and worked. Despite gentrification, it’s still quite working class. There are some ateliers left and a museum to the craft of silk weaving. Perrache is the most recently renovated area, leading south from Perrache station to where the two rivers meet. Originally industrial, now it’s the trendiest area with a factory transformed into a huge art gallery, modern housing and restaurants. Part-Dieu is on the right bank of the Rhône and is the main business area. But there are some great attractions here like the impressive Les Halles de Lyon - Paul Bocuse indoor market. Cite Internationale is north of the center with the European headquarters of Interpol housed in a building that looks the part. Just to the north are the red sleek apartments, hotels and restaurants designed by Renzo Piano (of Beaubourg fame). The Musée d’Art Contemporain has great temporary exhibitions. Parc de la Tête d’Or is where Lyon comes to play. It’s a vast park with a boating lake and children’s amusements. Also in this area are two great museums are worth seeking out: The Centre d’Histoire de la Résistance et de la Déportation shows the barbarities of World War II Lyon; the Institut Lumière, the Cinema museum, is located in the Art Nouveau villa of the Lumière brothers, pioneers of early film. There's the widest possible range of accommodation in Lyon from top hotels to cosy bed and breakfasts. The Tourist Office has a booking service. La Villa Florentine stands looking over the city on Fourvière hill. This former convent, a member of Relais et Chateaux, is pure luxury and a judicious mix of the old and the new. The restaurant, Les Terrasses de Lyon offers a great panorama of the city and terrific modern cooking with menus from 39 euros. There’s also a heated outdoor swimming pool open all year round. Needless to say, it’s expensive but worth it. La Tour Rose is perfectly located in a restored 16th to 18th-century building in the middle of Vieux Lyon. Large rooms with wooden ceilings and tiled or wooden floors and comfortable furniture, it also has a restaurant of note. Rooms from 230 euros. 22 rue du Boeuf, 00 33 (0)4 78 92 69 10; Website. Hotel du Simplon is a good value 2-star hotel. Some rooms are quite small but they are adequate and you get a great welcome. It’s located just above Perrache station near Place Carnot and easily accessible. No restaurant but there’s breakfast in a large separate room. Double or twin-bedded rooms are from 60 to 107 euros. Lyon rightly has the reputation of being France’s gourmet capital. Much of it started with the Mères Lyonnaises, the ‘Mothers of Lyon’ who were ordinary cooks for the rich. When times changed and cooks went as cooks do, they set up their own restaurants. Today Lyon has restaurants for every taste and every pocket; traditional brasseries and the best modern styles. At the top end, there are restaurants from the great chef, Paul Bocuse who has quartered the city with his restaurants: Le Nord, Le Sud, L’Est and L’Ouest. Unique to Lyon are the bouchons, traditional eateries which feature meat, are simple, joyous and honest. There are great shops in Lyon. Start in Rue Saint-Jean in the heart of Vieux Lyon where you’ll come across individual shops. La Petite Bulle at no. 4 is a great comic shop where artists and authors appear for special signings. At No 6 the Boutique Disagn’Cardelli is a puppet shop in the Guignol tradition at where they make their own wooden puppets. The street continues with a bookshop, Oliviers & Co who have shops all over France selling olive oil, patisseries, a candle shop and one selling toys. Antique shoppers make for rue Auguste-Comte running south from place Bellecourt. Chic clothes shops are found in rue Victor-Hugo north of place Bellecour. For food shopping, your first call must be Les Halles de Lyon – Paul Bocuse on the right bank at 102 Cours Lafayette. Top names like Poilane bread and individual specialist delis fill the modern building. Lyon has markets almost every day in different districts. Every Sunday the banks of the Saône are home to bouquinistes, or second hand book sellers, just as colorful as their famous Parisian counterparts. And watch out for craft markets and brocante and antiques markets as well. Check with the tourist office for details or go to their shopping section on their website.